HP has announced wide range of devices tablets, ultrabooks, laptops & All-in-One PC running on Windows 8 and also revealed the prices of all devices. Hybrid tablet HP ENVY x2 with keyboard is equipped with 11.6-inch touchscreen display with a resolution of 1366×768 pixels. It also contains an efficient processor Intel Atom Clover-Trail. Manufacturer has estimated the price of HP ENVY X2 at $ 850, and its sales will begin on November 14. Ultrabook HP ENVY TouchSmart 4 Ultrabook with a 14-inch touchscreen display (resolution of 1366×768 pixels) equipped with more than the Intel ULV series and as an option can contain AMD discrete graphics card with 2 GB of memory. This model is now available for pre-order at a price of $ 900. Segment premium solutions presented ultrabook HP SpectreXT TouchSmart Ultrabook with 15.6-inch Full HD IPS display. This new product has higher performance components and boasts of having the port Thunderbolt. Sales of the device will begin in December at a price of $ 1,400. 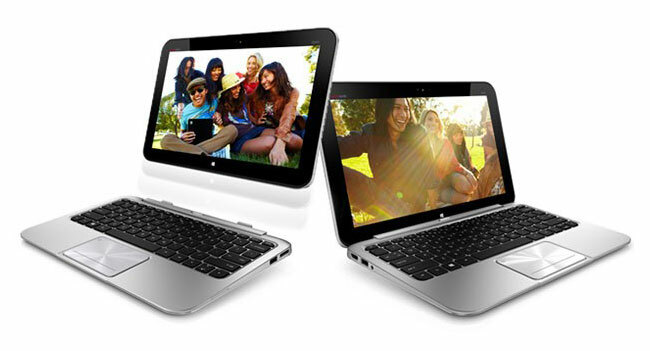 Standard laptops HP Pavilion Sleekbook 14 & 15 are designed to perform a wide range of daily tasks. They are already available for pre-order for $ 500 and $ 580, respectively. Laptop HP ENVY m4 is more productive entertainment solution. It is estimated by the manufacturer at $ 900 or more. Laptop HP Pavilion dm1 has on board 4G modem and offers the user up to 200 MB of free Internet traffic on the network operator T-Mobile. The price of this laptop starts from $ 500. Monoblock PC HP ENVY 23 and ENVY 20 TouchSmart with screen sizes 23 and 20 inches, respectively, are positioned as consumer decisions. They support the ability to touch and recognize up to 10 simultaneous touches. They are already available for pre-order at a price of $ 1,000 and $ 800, respectively. Monoblock All-in-One PC HP SpectreONE with 23.6-inch screen model is entertaining. It also supports NFC. The device will go on sale in November for $ 1300. Another non-touch monoblock is a budget model HP Pavilion 20. It has a compact size. Price starting configuration starts at $ 450. Desktop computer HP ENVY Phoenix h9 is intended for use by people who are addicted to games, and digital content creation. It is already available for pre-order at a price of $ 900. For the business, HP offers Tablet ElitePad 900. Its sales to begin in January next year and the price to be announced. Also designed for the business and ultrabook HP EliteBook Folio 9470m whose price starts at $1050 and sales will start on October 26. These all about the HP ENVY x2, HP ENVY TouchSmart 4, HP SpectreXT TouchSmart, HP Pavilion Sleekbook 14, HP ENVY m4, HP Pavilion dm1, HP Envy 23, ENVY 20, HP SpectreONE, HP Pavilion 20, HP ENVY Phoenix h9, EliteBook Folio 9470m and ElitePad 900 devices running Windows 8, stay tuned for reviews regarding these devices and for more updates.